I've always loved cacti and succulents; they are the most unusual and beautiful plants. When I was a little girl, maybe twelve years old, I had a cactus garden growing in a pink ceramic pot on my dresser. I was in love with all things southwestern at the time and even had a cow skull decoration in my cactus garden. One cactus I had grew so well, and I was so amazed by its growth, that I measured it weekly, keeping a little log sheet. Unfortunately his spurt came to an abrupt end when he suddenly got all mushy and died. It was disappointing, but my love of cacti remained strong. When Steve and I were newly married and living in our first home, we bought a cactus for our living room. There was a part of the cactus that looked very much like someone waving so we affectionately named our cactus "Yo". Unfortunately he died as well - got mushy and died, poor guy. I don't have many places in my house now where plants survive, (not to mention, while I love cactus, I do not have the best track record when it comes to keeping them alive), so I decided to crochet myself a little cactus garden. I wanted to make this all with scraps, so lacking an assortment of greens, I opted for some different colors. 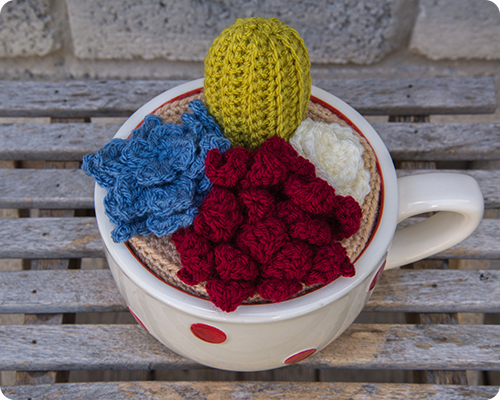 I love how it turned out....colorful cacti in a polka dot mug. 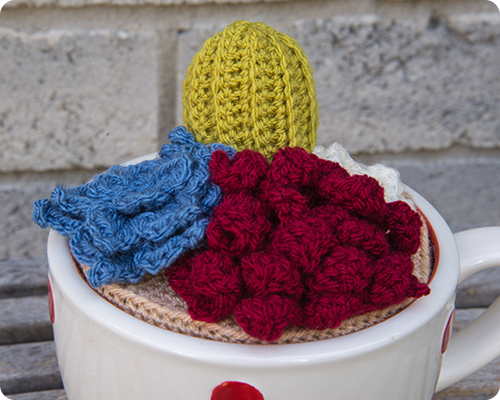 I've thought of finding some old tea cups at the thrift store and then crocheting some cacti and succulents for inside them....just a thought right now, a fun creative idea....we'll see if it comes to be.